Green Thumb in Bellingham | Serving Bellingham, Ferndale & Lynden for nearly 30 years! Green Thumb Company, LLC in Bellingham, WA has been selected for the 2015 Best of Bellingham Award in the Lawn Maintenance category by the U.S. Commerce Association (USCA). Various sources of information were gathered and analyzed to choose the winners in each category. The 2015 USCA Award Program focuses on quality, not quantity. Winners are determined based on the information gathered both internally by the USCA and data provided by third parties. The U.S. Commerce Association (USCA) is a New York City based organization funded by local businesses operating in towns, large and small, across America. The purpose of USCA is to promote local business through public relations, marketing and advertising. 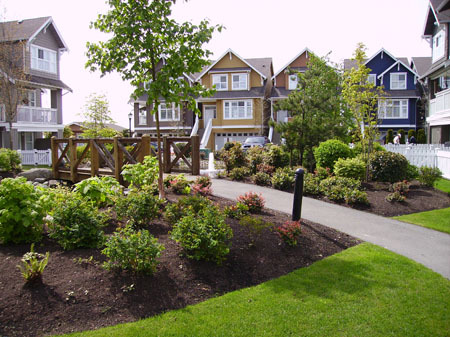 For residential and commercial landscape maintenance in Bellingham, WA – call Green Thumb Company. 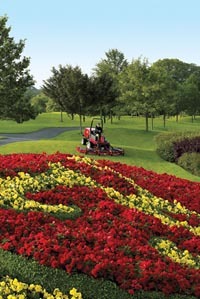 A consistent and well thought out landscape maintenance contract is the best way to protect your outdoor investment. A well-kept landscaped yard sends a special message – regardless if your style is symmetrically subtle or brightly and texturally dramatic, and says a lot about the owners. A well maintained landscape can also make the curb appeal of a house “pop out” from the neighboring surroundings, which is vital when it comes time to sell your home. But regardless of what reason is most important to you, the simple act of coming home to a lovely yard is one of the best feelings in the world! After spending a considerable amount of money on your landscape design and installation, it only makes sense to both protect it and ensure that it develops as you’ve planned. That is where a landscape maintenance contract comes in. We offer scheduled maintenance contracts, vacation and seasonal programs as well as comprehensive property clean ups and work both with residential and commercial home owners. Green Thumb Company’s Landscaping and Yard Maintenance Contracts are custom designed according to the needs of our customers’ landscapes — as well as their budgets. We listen to your preferences and note what you don’t like, versus what you enjoy doing yourself in the garden, to create a plan that is perfect for you! Seasonal and vacation services might include leaf removal, bark and mulch spreading, weed control in planting and flower beds, gravel refurbishing, lawn renovation and more. Contact us at 360-671-LAWN (5296) to discuss your landscape maintenance needs for Bellingham, Ferndale and the surrounding neighborhoods like Birchwood, Edgemoor, Happy Valley, Geneva, Barkley, Cornwall Park, Columbia, Sunnyland, Fairhaven, Sehome, Whatcom Falls, South Hill and King Mountain. For more than 24 years, Green Thumb Company has specialized in servicing many of Whatcom County’s fine neighborhoods. Let us help you out with your landscaping needs with a contract designed specifically for you! It’s true, all of us, (including me!) have been guilty of waiting until the last minute to start gardening projects. And, yes, I have underestimated what it takes to take a project from dream to reality. Come springtime, the sun is out and I’m itching to get back into the garden – but my design isn’t completed, and now I’m crazy busy with work! I missed my window of opportunity and darn it all if my project won’t get finished now for months. I KNOW better..! Each spring following the first sunny weekend, our office gets excited calls from folks anxious to design and build their new gardens, discuss landscaping projects and launch into creating their dream backyard…immediately. Guess what? While you might wait to call in spring – all that means is that your design project will begin in the spring, but it likely won’t be finished until much later in the year. The reality is planning for your springtime projects should begin in winter – if not much earlier…Why wait when you can start now? 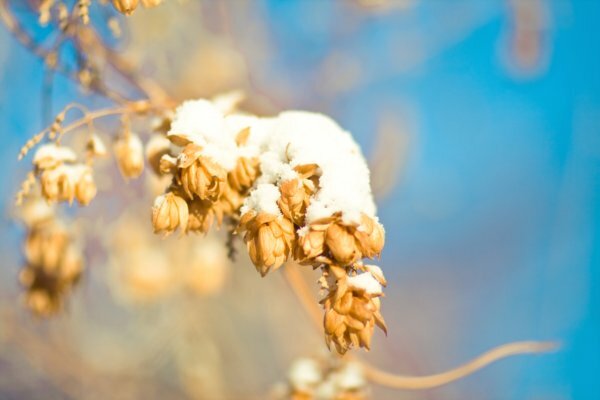 Whether you’re hoping to put in a new vegetable bed, renovate your ornamental shrub borders, design your perennials garden or create a new project from scratch, it’s important to jump into the planning phase as the icicles are dripping from the eaves. If you wait until the spring sunshine to start your planning, be ready to wait even longer to watch your garden grow. Don’t let winter get away from you. Jump into your project now – even as you finish mulching your garden beds and start checking off your Christmas shopping list. I’ve put together a list of a few resources to help get your creative juices flowing. Go fetch a cup of tea, boot up your computer and settle into your chair to and begin your springtime planning today. biology.burke.washington.edu/herbarium/imagecollection.php – Fantastic site with 1000’s of plants and images specific to the northwest. Excellent help for plant identification. www.plantnative.com – Includes a nice step by step plan for naturescaping. http://www.rainyside.com/ – Maritime Pacific Northwest Gardening has a nice native plant section with photos. http://seattletimes.nwsource.com/html/plantlife/ A selection of articles written by Valerie Easton, a Seattle freelance writer and contributing editor for Horticulture magazine. 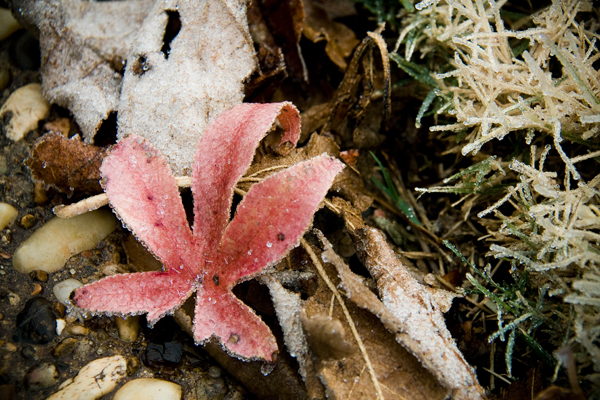 http://www.wnps.org/ – A non profit organization for native plants. gardening.wsu.edu/text/nwnative.htm – Identifying, Propagating, and Landscaping. Nice photos! Pacific Northwest Native Wildlife Gardening. www.tardigrade.org – Includes a listserv for gardening for wildlife (with native plants). www.puyallup.wsu.edu/~Linda%20Chalker-Scott/ -Puyallup site full of horticulture myths. Very informative! plants.usda.gov – Lots of information and images on plants beyond the northwest. Green Thumb Company is a Bellingham based, full-service grounds maintenance company. We have a commitment to provide great landscaping services with outstanding customer satisfaction and have been serving Whatcom County customers in Bellingham, Ferndale and Lynden for more than 20 years. After a long, wet Pacific Northwest winter, these early spring-blooming bulbs offer a welcome preview of the flowers and colors to follow. Nothing signals the end of the winter season like seeing the first crocuses poking their heads through the last of the wet, dark soil. 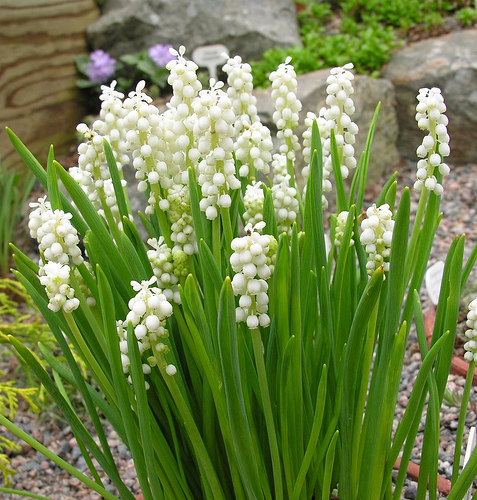 Few plants are as easy to grow, or as rewarding, as the early-blooming bulbs. The only challenge is remembering to purchase and plant the bulbs during the excitement of the summer and fall gardening season, (it’s always hard for me to remember just how bleak the garden can look in late winter). Plan now for fall planting, and come spring you’ll be glad you did! I’ve put together a selection of early-blooming bulbs that grow well in the area. Since many of these are small in size and statue, they look best planted in relatively large numbers. Don’t be intimidated by the thought of planting 100 or more bulbs; the tiny bulbs take just seconds to plant, especially if your soil is relatively loose. Simply make a slice in the soil with a trowel about 4 inches deep, wiggle it a little to make a hole, and, holding the soil back with the trowel, drop in the bulb. As you slide out the trowel, push any scattered soil back into the hole, then water the area to settle the soil. Spring beauties are one of the earliest spring flowers to bloom. 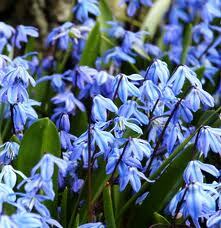 Flowering for a remarkably long time they bear clusters of bloom spikes that offer scented deep blue flowers. Exquisite when planted under spring flowering shrubs such as forsythia, azaleas, rhododendrons, and magnolias. 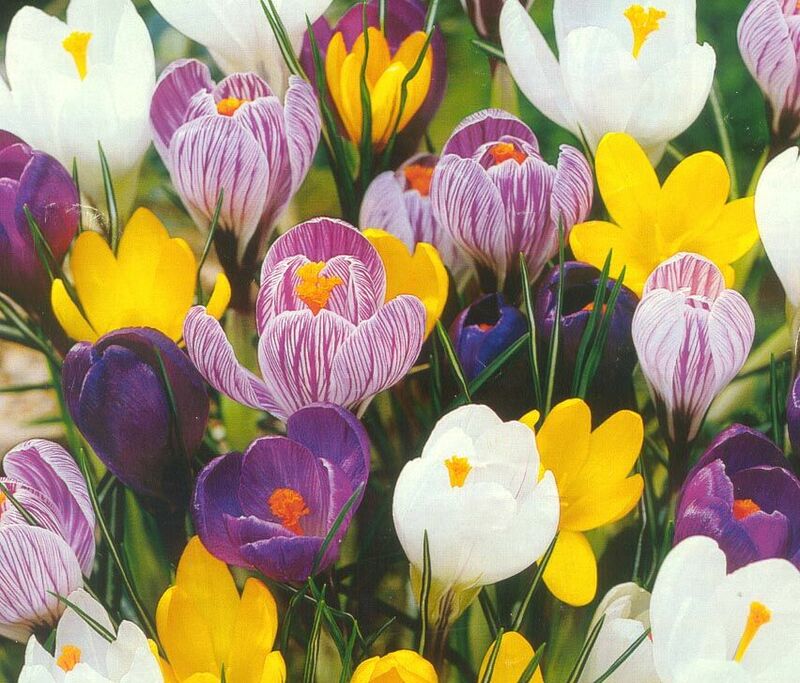 Unlike snowdrops, crocus ring in the spring in a range of colors. Since the bright colors contrast with any remaining snow, they are wonderful planted in masses so you can enjoy a carpet of color from a distance. In the case of crocuses, more is definitely better! And like snowdrops, crocuses will multiply each year, especially if they are planted in the very well-drained soil they prefer. Sometimes called Glory of the Snow, these beauties will blanket the ground with blue in early spring. 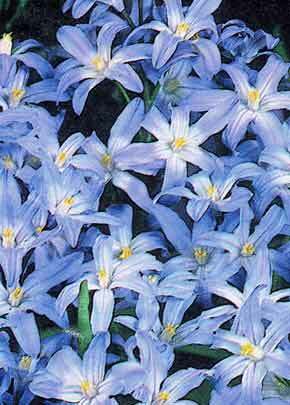 Each bulb produces multiple star-shaped, sky-blue flowers. 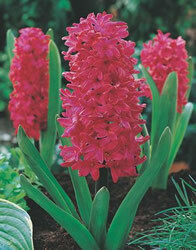 Just 4 to 5 inches in height, they look best planted in large drifts, and will multiply rapidly. Grape hyacinths aren’t true hyacinths, but instead are in the genus Muscari. However, if you look closely at these flowers, you’ll see the resemblance to hyacinths in the clusters of tiny flowers atop strap-like foliage. Grape hyacinths are so eager to multiply that they can become weedy–that is, if you consider a plant with such beautiful flowers a weed. Plant them where they can spread freely–in the lawn, under shrubs–rather than in a formal bed. If the grape hyacinth above, with their diminutive stature and often muted colors, gently announce the arrival of spring, these two true hyacinths yell it from the rooftops! Not only are they extravagant in appearance, they are also wonderfully fragrant. 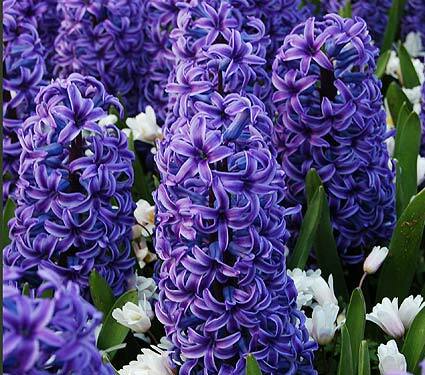 Add these to the fact that hyacinths are very easy to grow, and there’s no reason not to include at least a few of these beauties in your garden. They are also excellent for forcing indoors, where you can enjoy their scent each time you pass by. While there are hundreds of varieties of beautiful spring bulbs, I hope that this list can get you started thinking about planting some bulbs of your own this fall. Start looking now for your favorites when you are out and about town, check out the local gardening shops this spring for different varieties and ask your neighbors what it is, if they have something blooming that catches your eye. Take notes and come fall, be ready to plant! I hope you are loving all the bounty that spring brings us in Bellingham – my family and I sure am.